Activation promotes brand's fragrance arm. 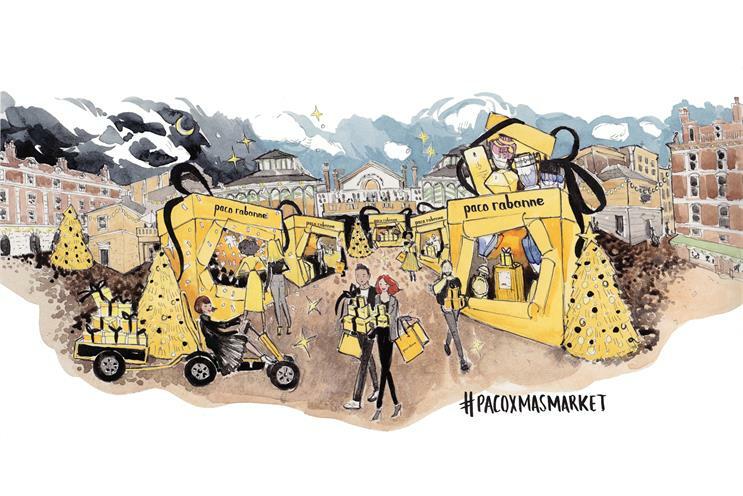 Paco Rabanne, the fashion brand owned by Puig, is creating "fragrance-inspired" Christmas markets across the UK to celebrate gifting. Visitors will be able to buy the brand’s fragances, sample mince pies and book in for express manicures. There will be "fragrant golden blasts of glitter" at regular intervals throughout the days, encouraging people to create Boomerangs on Instagram. All shoppers can claim a complimentary Christmas bauble that's hand-finished by calligraphers at the event. The experience runs from 30 November to 23 December, taking place in Manchester, Birmingham, London and Liverpool. It is being delivered by MKTG and Starcom. Aliki Zachariadis, Puig’s UK marketing director, said: "We’ve been known as a fragrance brand to deliver beautiful storytelling through our innovative bottles and ads. However, this is no longer enough to capture the attention of millennial consumers who seek experiences above anything else. "With the Paco Rabanne Christmas market, we hope to bring our story to life through a totally immersive experience during the most important gifting period of the year." The future of cinema: will all recorded entertainment be experienced?